Although BYOD (bring your own device) was once just a trend, whether you like it or not it looks like it is unavoidable and here to stay. So the important thing to do now is buckle down and take all the necessary precautions to get prepared and take advantage of all the great benefits BYOD has to offer your organization. Although a BYOD solution offers loads of benefits, it can bring with it many challenges and concerns. So don’t just let BYOD happen without being prepared. 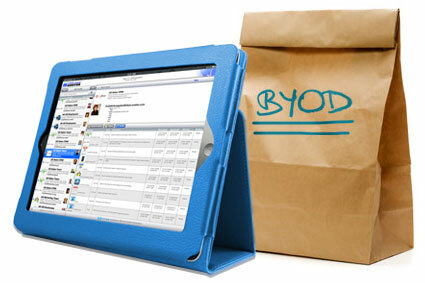 Check out these 7 critical BYOD blunders to avoid when planning your BYOD strategy. Do all your employees really need access to all applications? Each organization will be different, but you need to decide on who will have access to what data. Obviously everyone does not need access to everything. Lack of data control can cause quite a few issues in the future, so do not forget to do it. Many companies fear or even try to ignore BYOD and just hope it goes away, but guess what…that’s probably not going to work. You might as well BYOD before it happens despite an official sanction. You can mitigate risks; you just need to have a plan and a process that meets the needs of your company. Not all apps are created equal. Apps can include malicious components aimed to introduce viruses or steal data. Also, you want to make sure your employees are being efficient. Not playing around on Facebook and Angry Birds. Therefore, some apps should be banned or restricted and some should be encouraged and allowed. Make sure this isn’t something you just overlook. Having a mobile device management program to help manage remote workers and other security precautions in place first is a must for any BYOD program. Mobile device management is necessary to deliver and uphold good service quality for users and for service providers and organizations to deploy, manage and secure mobile devices proficiently. Failure to incorporate MDM causes quite the headache for IT. A BYOD policy should include minimum criteria for acceptable on-premise devices. Organizations must have the ability to check for those criteria and restrict access to non-compliant devices. Otherwise you are opening up a whole world of vulnerability for your organization. This is something that should be included in every corporate BYOD policy. If a device is lost or stolen or when an employee leaves the company that device needs to be wiped of all sensitive data, apps, etc. Although this is a controversial topic for many, it is necessary to keep sensitive information secure. Be sure everyone is aware of whatever guidelines you set for this ahead of time so there are no surprises later on when the wipe is necessary. Just because they have smartphones doesn’t make them smart mobile users. Employees need to have some guidance on what they should and shouldn't do with their mobile devices on your organizations secure wireless network. Give them education and training, and then ask them to sign a document about complying with your company's policies. Use this list wisely to avoid making possibly detrimental mistakes with your BYOD implementation. If your organization is considering implementing a BYOD solution and have any questions or just need some guidance, please feel free to contact us here. We have helped hundreds of organizations implement secure and successful BYOD solutions and are always happy to help!